UCSB alum Mohamed Faroug Abdelrahman Ali, who supervised the town excavation in Tombos, stands in a dry moat, part of an ancient fortification. 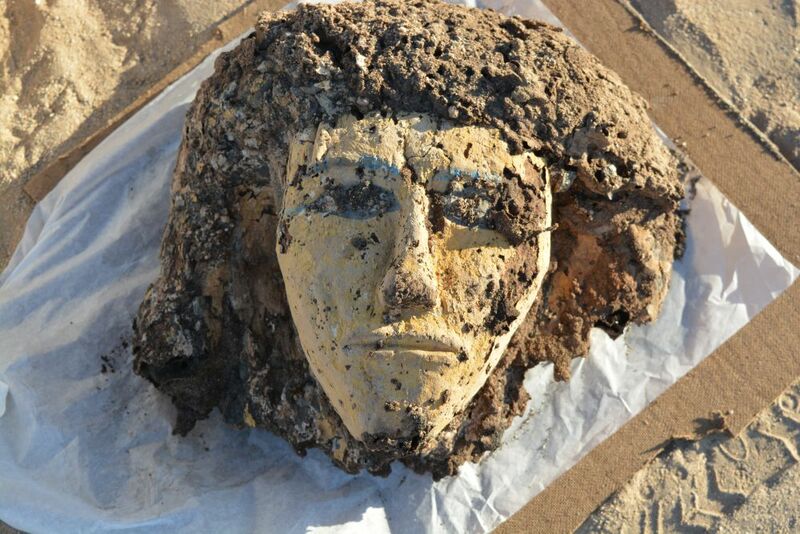 A head from a woman's coffin dating to the 18th Dynasty, roughly 1400 BC. It came from tomb near Tombos. Inscriptions carved into granite outcroppings at the Third Cataract of the Nile. They're about 100 yards north of the Tombos fortress and commemorate Thutmose I's conquest of the Kingdom of Kush in 1502 BC. 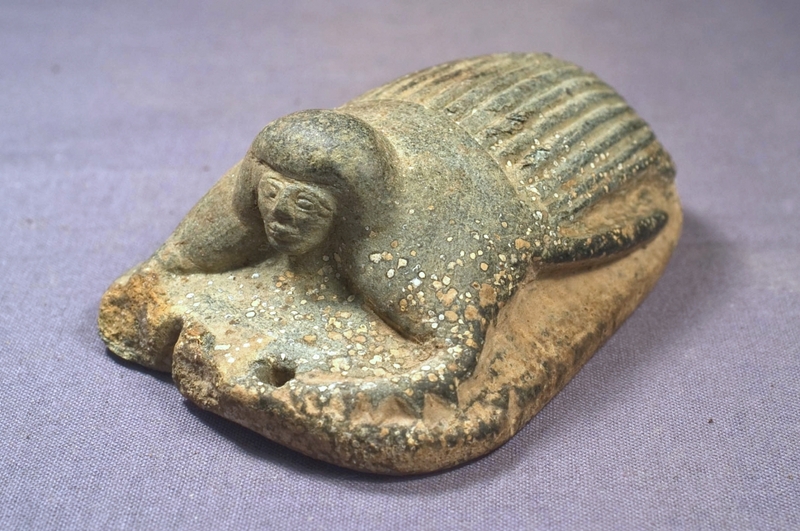 This heart scarab from the tomb of a woman named Weret, was inscribed with a spell from the Book of the Dead that prevented a person's heart from testifying against them in the divine judgement. A scarab with a person's head is rarer than the purely insect type. 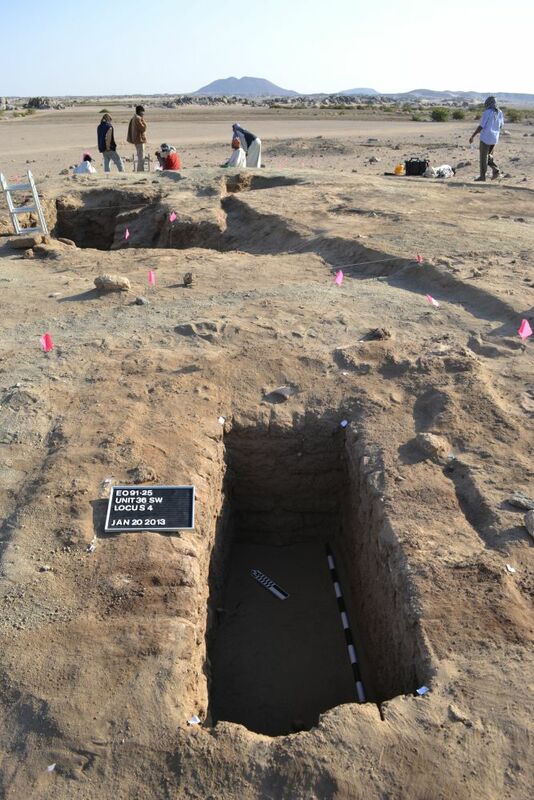 Two New Kingdom (c. 1550-1070 BC) tombs excavated near Tombos. Since he and his team began excavating the ancient Egyptian colony of Tombos in Sudanese Nubia, Stuart Tyson Smith has made a host of discoveries. But something eluded the UC Santa Barbara professor of anthropology: evidence of the fortifications typical of a settlement on the frontier. No longer. In a chapter of a new book, “From Microcosm to Macrocosm: Individual households and cities in Ancient Egypt and Nubia” (Sidestone Press, 2018) Smith and his co-author, Michele Buzon, a professor of anthropology at Purdue University, detail their discovery of the foundations of a fortress at Tombos that likely dates to the colony’s founding around 1450 BC. 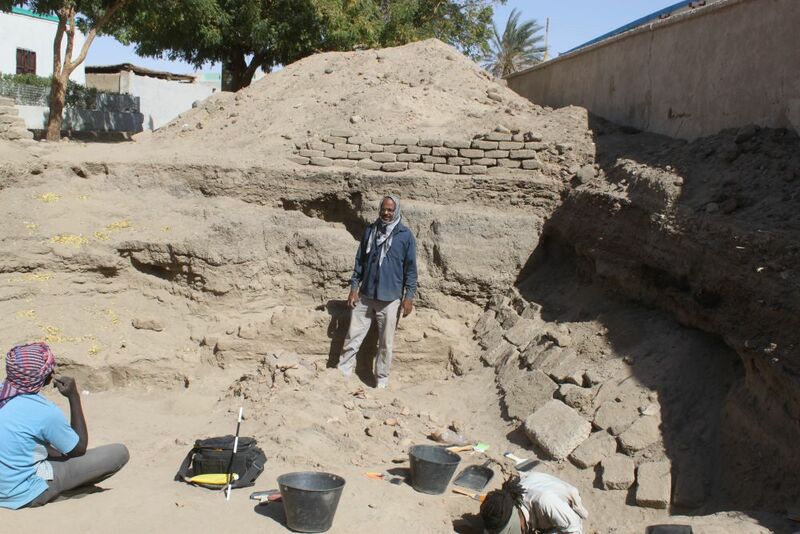 The discovery of massive fortifications — 400 meters a side — helps cement Tombos’ place as an important Egyptian colony of the New Kingdom (c. 1550-1070 BC), said Smith, who has excavated the site in Sudan with Buzon since 2000. In “The Fortified Settlement at Tombos and Egyptian Colonial Strategy in New Kingdom Nubia,” Smith and Buzon write that the first hints of a fortress at Tombos date to the first years of the 16th century BC, when the pharaoh Thutmose I conquered Kush and incorporated Nubia into an empire that would last through the end of the New Kingdom. 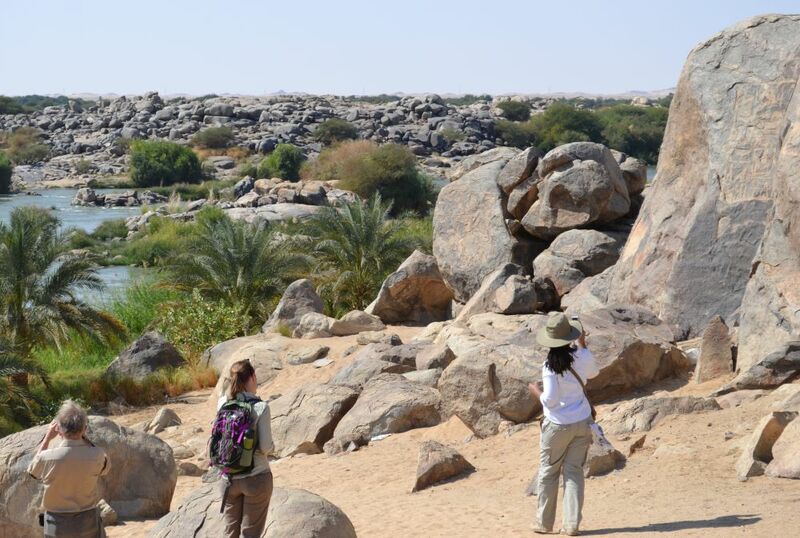 Not long after, Thutmose I ordered inscriptions carved on granite outcrops at Tombos, which Smith and others have argued signified an internal boundary within Egypt’s Nubian empire at the headwaters of the Third Cataract. Interpreters of the inscription have said it refers to the construction of a menenu, or fortress, at the site — although no fortification had been found. Fast-forward more than 3,500 years. Beginning in 2013 and continuing through the 2015-17 field seasons at Tombos, Smith and Buzon discovered evidence of buildings and what they termed “a massive new fortification.” Distinctive pottery types, inscriptions and radiocarbon dates indicate that it was built around 50 years after the conquest, probably commissioned under the joint reign of Queen Hatshepsut and her stepson Thutmose III (c. 1578-1458 BC). “One of our goals was to find the town where people were living,” Smith said. “We knew it was somewhere under the (modern) village because we’ve seen pottery and we’ve done a couple of little tests and found some foundations in one spot, a bunch of pottery in other places. And so we decided to go all in and just start digging in every open space the villagers would let us dig in. And they were very nice about it, which I have to say is typical of the Nubian people who have been our hosts all these years. Smith and Buzon weren’t sure what it was, but in the next two seasons they kept following it in both directions. They dug a number of test trenches to see how far it went through the village. “It just kept going and going,” said Smith, noting it ran far past the southern edge of the modern village and out to the Nile to the west, a span of more than 200 meters to a side. It is, he said, larger than any of the other fortified colonies going back to the Middle Kingdom (c. 2050-1710 BC). Smith said he suspects Siamun was in charge of the annual payment of tribute to the pharaoh, likely gold as his title suggests, but also other products like cattle, ivory and ebony. He described it as taxation framed as reciprocity: provide for the king and he’ll assure your safety. It’s a common practice across cultures, Smith noted, one typically described as ritualized tribute framed as a kind of gift exchange. Although the empire’s formal boundary lay far upstream near the Fifth Cataract of the Nile, Tombos’ location on the east bank of the Nile at the Third Cataract and its massive fortifications, Smith said, would have made it a powerful symbol of the kingdom’s power and influence at a symbolic internal boundary within the empire, only 10 kilometers north of the conquered capital at Kerma. Downstream the Egyptians inserted a series of fortified colonies like Tombos, but upstream they adopted a more hands-off policy, allowing a degree of local autonomy. Smith estimates the fortress was an active defensive structure for 100-200 years, after which the trench begins to fill with trash. Why? The answer may lie in what he calls the “cultural entanglement” — the process by which colonizing powers and indigenous people influence one another and change over time — of Egypt and Nubia. Smith and Buzon’s work in the cemetery just outside Tombos has provided strong evidence of such close integration between the Egyptian colonizers and their Nubian subjects that their cultural entanglement led to a blurring of cultural identities. With that, Smith suspects, the threat from Nubia — and the need for a great fortress — would have evaporated in the desert heat. Looking ahead, Smith said he wants to search for the temple and houses that would have been a part of the fortress. Tombos, it turns out, is the gift that keeps on giving. Smith and Buzon’s work in Tombos have been supported by grants from the National Science Foundation and the National Geographic Society.